To take full advantage of this e-book you must have scripting turned on in your browser. Without it you will not be able to use the temperature converter, the Causes-Effects trainer, the electrical troubleshooting sections nor submit exam answers for automatic marking. There are many sections with large and sometimes full screen graphics which also have rows of buttons for user controlled sequential images. The screen shot below demonstrates how a user controlled "slide show", as well as a related scrollable text area have been designed to fit on screen simultaneously. This makes it easier to concentrate on the concepts at hand rather than scroll about looking for separate diagrams and text. The text suggests appropriate moments to click on specific buttons that correlate to the concepts being discussed. Learning is fun with interactive graphics. They make it easy to comprehend new concepts clearly, build a solid foundation and advance quickly. These buttons allow the troubleshooting boards to be viewed in Large, Medium or Small mode. The different sizes can be accessed at any time and changed at will. This can be convenient for tablet users depending on the tablets screen resolution and aspect ratio. The smaller graphics options allow PC and Mac users the opportunity to have more windows open simultaneously. However, since the smaller graphics are composed of fewer pixels they may not be as crisp looking as the graphics in the larger modes. Every board has the L, M, and S buttons. Most pages also have them. If there are no L, M, and S buttons on a page, then there are no size options available for that page. Refrigeration Basics III makes extensive use of graphics and animated graphics. There are also camera icons which when clicked in the CD version will open a pop up window of a photograph. Pop up blockers can interfere with this intended function. Click the camera to see an example. 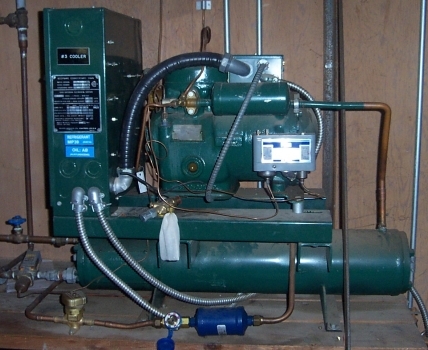 Purchase of Refrigeration Basics authorizes use on a single work station. If you wish to use Refrigeration Basics for groups of people, a site licence is required. Commercial use via a LAN, TV, large screen monitor or a computer projector requires a site licence. Site licences are available on our order form. When you see an Imperial unit in blue font you may click on the unit and it will be replaced with its metric counterpart. Try this example: 70 °F The troubleshooting boards can be configured for SI Units at the click of a button. The troubleshooting boards Help section tells you all about it.